Wow - Erin Healy has done it again with creating a story that immediately draws the reader into the pages of the book and holds your attention all the way to the end! "Stranger Things" is Erin's latest work and I think it is my favorite of her books! Serena's world is being turned upside down as a student destroys her career and then her place to find solace and guidance no longer holds this for her due to a dangerous encounter. I found myself eager to read just a little bit more and staying up way to late just to find out what will happen next all the way through. I highly recommend this book for everyone who has enjoyed Erin's previous novels. Enter Today | 11/18 - 12/12! About the book: One decision changed both their lives . . . but will love win in the end? Charlotte Rose Hill enjoys a comfortable life serving up country delicacies, uniquely blended teas, and matchmaking advice for her quirky, devoted customers. The only thing lacking is someone to share it with. At eighteen she denied Sam Wilder's marriage proposal after his family convinced her to walk away from their relationship. They both moved on . . . or so she thought. When Sam walks back into her life more than a decade later, Charlotte is surprised that her heart still quickens. But is it because of his presence? Or because of the presence of Sam's new fiancée? A second chance at love doesn't happen often, but their past may keep them apart. Is it too late for Sam and Charlotte? Meet the author: Best-selling and award-winning author, Anita Higman, has over thirty books published (several coauthored) for adults and children. She's been a Barnes & Noble "Author of the Month" for Houston and has a BA degree, combining speech communication, psychology, and art. Anita loves good movies, exotic teas, and brunch with her friends. "Marriage in Middlebury" is the first book I have read by Anita Higman and it will not be the last as I loved it! Charlotte has spent the last ten years of her life running her business, handing out advice and just living life, a comfortable and enjoyable life. However, this ends when Charlotte's ex-boyfriend walks into her job and introduces his fiancée and asks her to cater the wedding. As Charlotte spends time with Sam again after so many years, past feelings surface and she wonders if she is being given a second chance for love after she made her choice so many years before. This is such a well-written story filled with charm, and loveable characters. I loved the small town feel and the closeness that oozes out of the pages of this book and the relationships of the characters as their lives intersect with one another. I highly recommend this book; it offers a nice escape and has a welcome home feeling to it. Bethany House (a division of Baker Publishing Group) has released a bunch of excellent reads this year and many in just the past few months! Need a few more gifts to buy for a book lover (or for yourself! ), check out these books!!! "Into The Whirlwind," a historical fiction novel written by Elizabeth Camden, is filled with historical detail, romance, secrets, choices, and loveable characters. 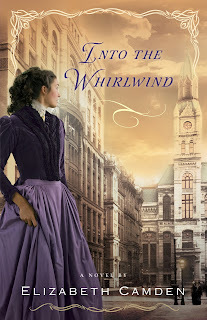 Mollie is the owner of her family's clock business and she is determined to run this no matter what even when the Great Chicago Fire occurs and she is given a better offer after the destruction. Zach enters into Mollie's life and Mollie is unsure of his motives. When some secrets are revealed Mollie is even more unsure and is faced with a choice that will change her life and determine her future and the future of her company. I really enjoyed this novel and I did not want to stop reading until I reached the very end! I became immersed in the characters' lives and into this time period. It was fascinating to learn of Mollie's clock business and to think of how it was to be a female businesswoman during this era. Elizabeth's style of writing is easy to get into and lost in the story. I was initially drawn to this book by the cover as it is both beautiful and mysterious and I was not disappointed in the least when I began to read it! 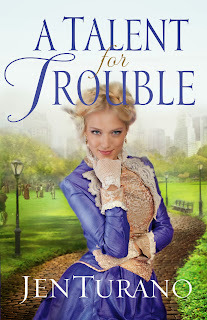 Jen Turano's novel, "A Talent for Trouble," is the third book in her Ladies of Distinction series and I loved it just as much as the first two in the series! Felicia is spunky, fun-loving and has been determined her whole life to marry a minister; until now when she embraces who she really is and lives her life that way. Grayson is trying to find his path in life as well and it seems that his path keeps on crossing with Felicia. As their paths intersect, these two learn more about themselves and each other while trying to deal with a trouble from the past. Jen Turano has quickly become one of my new favorite authors and this is one of my new favorite series! Each one of these books are fun to read and I have loved the characters as well as the experiences they have. I feel as if I become a part of their lives and situations! I also love the fact that the characters from the previous novels in the series continue to play roles so that there stories continue on as I fell in love with them! 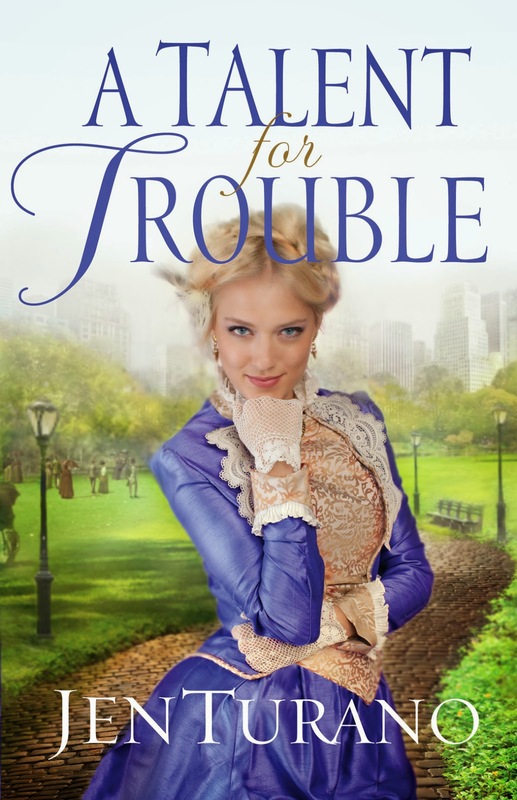 The cover of this novel brings Felicia to life so well and her personality just oozes from this picture! This is a must-read and one that will find a home on your bookshelf! Nancy Mehl has created a town and community that is close-knit and home to many, but also a place that has its' share of secrets and trials. The reader can read to Kingdom in "Unforeseeable," book three in Nancy's Road to Kingdom series. Callie is loving life and is excited for her future as Mrs. Levi Housler; however this changes when she realizes a killer lives in this safe community and those whom Callie loves seem to know more than they are willing to tell her. As the search for answers takes place, Callie must learn to ultimately put her trust in. I fell in love with this series in book 1 with Lizzie's story as it was so unlike books I had read and filled with characters whom were easy to empathize with and hope for the best for and also a healthy dose of suspense mixed in to keep me on the edge of my seat reading and continuing to turn the pages to unravel the secrets. I was so excited to finally be able to read Callie and Levi's story as they are characters whom I have wondered about. This is a series that must be read in order (and believe me you do not want to miss out on any of the Kingdom saga!) as the characters are in each book and this third book provides closure and ties up the loose ends. This is one that will have you experiencing all kinds of emotions and will leave you satisfied at the end. I highly recommend this book and series! You cannot go wrong when you see a collection written by these authors! "An Amish Miracle" is the perfect book for this busy time of the year, as it is filled with three short novellas that you can escape into for short periods of time in the midst of all the crazy busyness of life during the holidays. Each of the three women whom these stories focus on are all needing something in their lives and they feel at a loss; however help comes in the form of a miracle and sent by God. This is such an inspiring collection of stories and one that you cannot miss out on if you love Amish fiction and works by these authors!